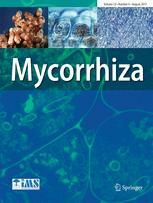 Abstract: The aim of this study was to compare the mycorrhizal responsiveness among old and recent Chinese maize genotypes (released from 1950s to 2008) in low- and high-Olsen-P soils and to identify parameters that would indicate the relationships between the mycorrhizal responsiveness and the functional traits related to P uptake of maize. A greenhouse factorial experiment was conducted. The factors were maize genotype [Huangmaya (HMY), Zhongdan 2 (ZD2), Nongda 108 (ND108), and NE15], inoculation with or without arbuscular mycorrhizal fungi (AMF) (Rhizophagus irregularis), and Olsen-P levels (4, 9, 18, 36, or 60 mg P kg−1). Old and recently released genotypes differed in their response to AMF under low- and high-P supply. Three kinds of responses (in terms of shoot growth) were observed: the response was positive if the soil P content was low, but negative if the soil Olsen-P content was high (HMY and ND108); the response was neutral regardless of soil P content (ZD2); and the response was positive regardless of soil P content (NE15). Principle component (PC) analysis showed that the first PC comprised morphological and physiological traits of maize roots, and the second PC comprised mycorrhizal traits. The opposite was the case, however, in high-P soil. It is concluded that maize breeding selection from 1950s to 2000s is not always against the AM association and that AMF play positive roles in promoting the growth of some maize genotypes in high-P soil. The root length colonization by efficient AMF might be a useful parameter for breeding varieties with increased mycorrhizal responsiveness.